With four gg grandparents born in Ireland it is no wonder that I am interested in Irish heritage and culture. Of the four it is only my gg grandmother Maria Jeffers who gives me any real insight into her life back in Ireland. However, I will also outline the other Irish gg grandparents just in case someone else is interested in those families. Maria Jeffers arrived in Brisbane in 1864. Maria (daughter of Isaac Jeffers and Harriet Ballantyne) was born in Portadown, County Armagh in 1844. Maria came to Queensland, Australia on board the Legion of Honour in 1864. She married Adam Johnston (see below) in 1864 in Brisbane, Queensland. In later life she had a close friend Abraham Francis and she is seen with him in this photograph. Of my four Irish ancestors, Maria Jeffers is the only one known to have kept contact with her family back in Ireland. A few surviving letters to and from one of her brothers who stayed in Portadown confirms this. The letters were in poor condition with pages and pieces missing and had been given to one of Maria’s grandsons on a collateral line who kindly let me photocopy them many years ago. One of my father’s elderly cousins also said that Maria wrote to a brother in the USA but we had no proof until I recently received an email from someone in the USA descended from that brother. We are now exchanging information and pooling what we know on the family in Portadown. The first letter I have is undated but seems to be re-establishing contact, possibly ca 1904. Just a line to say I got your letter all right. Am glad to hear from you would be well pleased to hear from you at any time, perhaps you will come over and see us all. If so, I would give you a good reception, and would keep you as long as you liked or in fact altogether. We have none of photos just, this weather is gloomy and dark, but in a few weeks when it brightens up, we will get them all taken, and will send you a copy as soon as possible. My second wife has two daughters, will send them too, I have no great news to tell you of, except we are buying out our farm off the landlord at about 160 pounds sterling. The names of the two girls are Minnie she eldest about 18 years of age and Annie about 14 years. Minnie would willingly correspond with Maria is she cared to do so but in writing address put Minnie Calvin. NB Maria was Maria’s youngest daughter born 1882. There are a great many changes here since you went away all the old neighbours are either dead or left long ago. John Woods is living (where Willie Brann lived) married one Bella Moore but he is dating long ago. All the other old neighbours are all away, the most of them dead. Mary King is still living in Richhill yet, she goes about the country with a pack and she has gathered money. The old mill has gone to ruin not a soul living about it now. Mr Orr’s have left the course. I wont beelong behind my James then we will meet to part no more the children are all with me yet I have it hard with them but will do what I can to Albert is left school I will do it for his father’s sake. They want the farm sold but it was so far in debt nothing is left when the first wife died the place was sunk in debt……..
Another letter dated 2 Dec 1910 from Ellen indicates that she is not well again, still missing James and that she has included a photo of him with the letter. Sadly that photo doesn’t seem to have survived or no one knew who it was when going through Maria’s things after she died in 1930. However I have a copy of one photo of two girls believed to be Minnie and Annie Calvin, James two step-daughters. It is inscribed ‘to Auntie from Minnie’. I am really grateful that these few letters have survived and it lets me know that Maria did make contact with her family again although after an absence of almost forty years. I wonder why she did after such a long time – what prompted her to make the effort to reconnect? My other Irish gg grandparents are briefly outlined below and I am always happy to share information with family members. Adam Johnston (husband of Maria Jeffers, son of James Johnston and Sarah McElwain) was born in 1842 in Knockbride, County Cavan and he arrived in Queensland, Australia with his brother James on board the Mangerton in 1861. 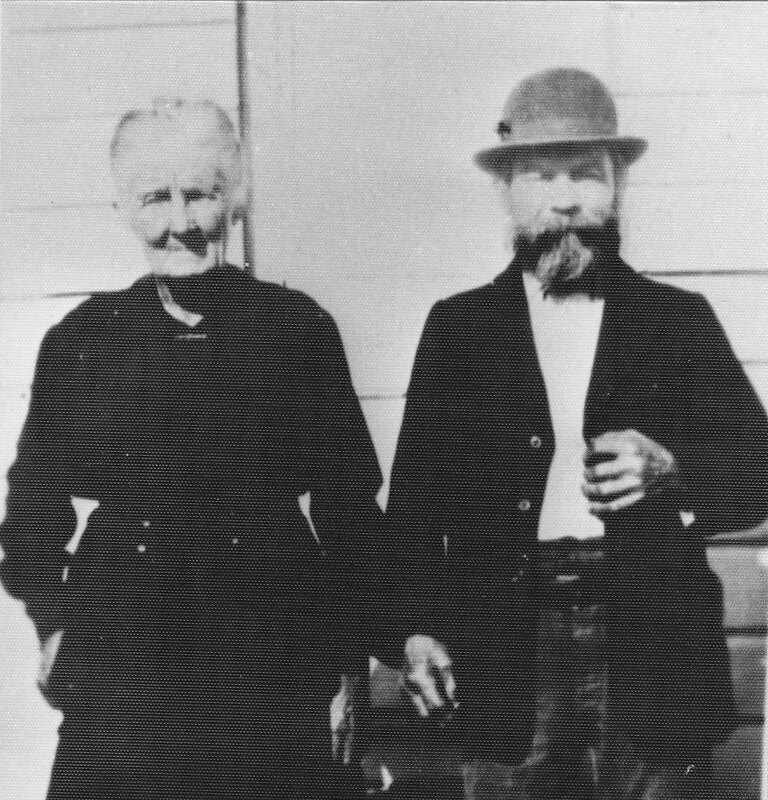 Adam and Maria had nine children but separated sometime in the 1880s and Adam had a relationship with Mary Tyrell and had another three children before his death in 1900. Numerous members of the Johnston family from Knockbride also came to Queensland and there are many descendants actively tracing the family. A number of meetings have been held in the last twelve months to pool information and to sort out the various lines and how they connect. John Finn (son of Francis Finn and Rosa Beakey) was born ca 1856 at Ballygannon, County Wicklow married Sarah Fegan in Rathdrum, Wicklow on 29 May 1879. Sarah (daughter of Robert Fegan and Sarah ?) was born ca 1862 at Glasnarget, County Wicklow. They arrived in Queensland, Australia in 1882 with their son Robert Finn born 1880 and another son James Joseph Finn born on board the Mairi Bhan during the voyage. Nothing is known about the Finn family in Ireland apart from these brief facts. If anyone has more information on the families above, I would love to hear from you and expand my knowledge of my Irish heritage and culture. Thanks for sharing your family’s Irish connections with us during the Carnival of Irish Heritage and Culture’s St. Patrick’s Day edition this year, Shauna. These family letters are true treasures. Best of luck with all of your continued Irish research! Thanks Shauna for this great information on our mutual grandmother Maria Jeffers. We are the mirror counterparts of two trees – the Johnstons and the Gundersons. I must start following your advice and record all my mother’s ‘stories’ for future generations. Hope to stay in touch and share more of our family history. I have some goose pimples running along my back at the moment. 10 Years ago I went to portadown to find some family heritage. I took my father Kerry. Story is My great gandfather’s name is James Jeffers. We went to the church where he was married and is seemes his ther was isaac and his mother was harriot. I am blown away!!!! I was reading the rest of your Blog taliing about Albert. My Granfather Albert was from Tandragee, His mother died and his father remarried. His Father James Died. The Albert in your letter is My Grandfather.He had an older brother Moses who was about 10 years older. Can you please send me your contact details it would be great to talk to you. It would be great to make contact with the US side of the family as well. Do you have their details? What a great blog! I’m sorry I haven’t been able to keep up with my family research. I am working crazy hours these days. I am still pulling together information and I hope to make a trip to Ireland in October to try and find more information on the Jeffers family. I see from this blog’s comments that we have possibly made another family connection! The power of the internet! I hope to hear back from you soon! I really enjoyed reading this post! Thanks Lyndsay and Kerry for the replies. It seems that after searching for the American link for years, one blog post and I manage to contact different lines of the family. Now all we have to do is update all our lines and see who is still missing. Thanks for making contact and will be in touch soon. Pilbeam is one of my partner’s families – Ann Pilbeam was his gg grandmother, she was born ca 1831 Battle, Sussex the daughter of Thomas and Esther Pilbeam. Ann married Benjamin Crow in Middlesex and emigrated to Queensland. So we don’t have any Pilbeam family in Australia that we know of. Sorry I can’t help. Hi Helen, I have a bit of information through the Rex Pilbeam line if you’re still looking? Just came across your 1992 Criminal Thesis and read about our mutual Great Grandfather Adam Johnston’s time in prison. Are you able to provide the details of how he ended up in prison in 1887? Could you possibly let Helen Dalmain know that it seems we share a great-grandfather – Reginald Archibald Harris – who indeed married Alma Emma Pilbeam in 1912 and went on to have 4 children,their initials G.E, E.B, G.L, and R.J. I have only just begun researching this with other family members and we’d all be very glad to find out more about the Harris’ and Pilbeams – and share what we know. We are descended from one of Alma’s two daughters who were placed into the Burnside Orphanage in Sydney after Reginald Harris deserted them all. mel reg harris named his other 4 children with parts of the names of the first 4 children unfortunately george edward died at birth and the other darling boy died in 1950 he was only 35 my dad was neville reginald bradbury lillian blanche , thora violet and george edward are my auntys and uncles these children also spent time in orphanage lots more i have the marriage and death certificates of reginald so dont buy those . bye for now helen very exciting times i wont be able to sleep now . thank you shauna for all your trouble just not meant to be searching grand father harris .